Contents: Text shipped to you. online multiple-choice test. Contents: Text and multiple-choice test shipped to you. 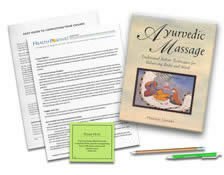 Do you have the Ayurvedic Massage textbook? See your enrollment options above for "I already own the text". Ayurveda is one of the oldest systems of health and healing in the world. Learn how Ayurvedic massage helps balance the body and mind. Through clear language and beautiful illustrations, this home study CE course describes how an expert practitioner performs Ayurvedic assessment and massage for a variety of clients including those who are pregnant, in labor, in postpartum and providing infant care. This course includes the benefits, key terms, indications and contraindications for Ayurvedic massage and recipes for creating your own Ayurvedic fragrant oils, nourishing facial creams, masks and clay baths. Applicable to all types of practice and especially valuable for MTs who provide spa services and a valuable reference guide for future use. Great content to introduce someone to Ayurvedic Massage. Learned enough to put into practice quickly! I enjoyed the detail and interesting facts. This was a very informative book that inspired me and added to my knowledge of Ayurveda. This is a very informative and convenient home course that I plan to incorporate in my future massages. The ayurvedic recipes are helpful. The course book is easy to follow and has a good flow. I was able to preprint the test to study by before taking the final online test. I will use this service again. It was a wonderful course and it taught me a great deal about essential oils and to realize how many different interesting fields are out there for massage! Fabulous course. Ayurvedic information I had not come across before. Author's in depth knowledge and intimacy with these teachings was evident and appreciated. I really enjoyed this course as I have a great interest in learning as much as I can to help my clients and to be able to give them the type of care that I believe they need. I found this course extremely educational and enjoyable. I would encourage others to take this course and feel confident in the quality of all the courses offered. This course was so powerful to me I might just change my college major! This is an insanely useful approach to natural healing and massage. Sparked my interest to learn more about this. There was a lot of useful information for a massage therapist. I have already begun to put techniques of Ayurvedic Massage into practice. It has made an excellent change, after 11 years of practice! It was a perfect class for a new mom. Mahalo! Material arrived quickly and was much better than I anticipated. Very interesting and informative. The course helped me focus on the most important information for practicing Ayurvedic massage. I enjoyed this course. I was able to go at my own pace and found that I went quite quickly through the material. I will be using this information to enhance my clients' massage programs. Awesome and easy to take! I enjoyed this course very much and would love to take more that you guys offer next renewal! Very good and informative class. The two courses I took were amazing. I loved this class!! Gave me new insites to massage!! I will deffinitily have a varity of oils on hand!! I really enjoyed this course. Excellent content. Opens new doors. I will use it in my practice. Thank You! I both enjoyed this course and learned a great deal from it. I have always been attracted to Ayurvedic practices and principles and appreciate this course. It was perfect in it's detail and not too overwhelming that I was able to understand the text. Thank you. I enjoyed it very much! I look forward to my continued studies with you in the future. Loved it! I can't wait to share! Excellent course, this will be most useful in my practice. It was a great course and I would recommend to a friend. Love being able to take courses and tests online. This has been my favorite at home course so far, I've learned so much about Ayurveda, I can't wait to add Ayurvedic Massage to my practice. Thanks so much. Information provided was great! I can't wait to start using some of these techniques in my own massage. I especially liked the different massage oil recipes and their uses! I am glad to have the text to refer back to for information. This course was very informative. The recipes for the oils used will be extremely helpful in my practice. The book was very informative and easy to understand. The techniques were easy to follow. Thanks! I believe that this course was very helpful and helped reground my thoughts about massage. I feel that this is helpful, and refreshing for all therapist. I love it. It was very interesting to see how different ayurvedic and western massage are. I found the course to be very informative and the materials were very easy to understand. The Ayurvedic massage course is not typically available on site, so this home study course was perfect. I enjoyed learning about the massage techniques, oils, and the principles of Ayurvedic massage. I am delighted with this course and the education I was able to receive because of it. I look forward to the next time I can use the Institute for my continuing education needs! I was really surprised by the descriptions of the hand-on portion of the course. Easy to read and understand. I have a much broader understanding of Ayurveda and the marma points. Thank you. Good course, material was easy to follow. Appreciated being able to complete CEs using a book I already owned. It helped me to finish reading the material and I did discover new ideas for massage oils and essential oils. I have always enjoyed adding the course books to my library. I enjoyed the flexibility of the learning materials. Great topic!!! I love the eastern traditional ideas regarding massage and medicine. Love acupressure and traditional tai massage info too. Thanks! Although I may not be able to jump into doing Ayurvedic Massage practices, the information and reminders about how there are so many different massage techniques around the world was important and interesting. This is a good course to get people interested in taking more of the appropriate amount of lessons in the subject matter. course was great, will continue to use your courses to fulfill my ceu requirements. this course was to the point and peaked my interest in Ayurvedic massage fundamentals. The materials and test for this course were excellent! Everything was clear and easy to understand. The layout invited me to learn more. I enjoyed this course completely! I really enjoyed reading this book. It was easy on the eyes to read. It was very interesting and I was surprised how much knowledge I gained about Ayruvedic Massage. I had no idea prior to taking this course what Ayurvedic Massage was. It had my attention so much that one night I read the book until after midnight. I am very anxious to start using this massage in my practice and on me. Excellent course, I love this formula! Another great course - quality content and materials. Thank you! Define Ayurveda, dosha, vikriti and marmas. Distinguish between the characteristics of vata, pitta and kapha. Identify the indications for and benefits of Ayurvedic massage. Identify factors that increase balance or imbalance to each dosha. Recognize the main points used to perform pulse diagnosis. Recognize the primary techniques and sequences used in a full-body Ayurvedic massage. Identify the techniques used by the author in pregnancy, labor, post-partum and infant massages. Recognize key elements in how the author prepared a traditional Indian beauty treatment. When the kapha/mucus dosha is dominant, ___ oil should be used for massage. Nice and simple. I'm a single mother so it's very valuable to me to be able to do my continuing education in my home at my pace and on my own time; I don't have to sacrifice time with my daughter, in fact she enjoys looking at the material too. They are also affordable. I live in a rural area so getting to classes and seminars can be cost and time prohibitive. Thank you for your wonderful service.